I had a bit of a eureka moment recently, when looking around our flat and trying to put my finger on what exactly it is still missing. There's nothing else we need, so why doesn't it look finished? Plants. In our haste to buy coffee tables, lighting, bedding and art we'd sort of forgotten that house plants even existed. Once we added a couple, we were astonished by the difference a little greenery made. Whether you live in a bright, airy, Scandinavian apartment, like this one, or a slightly dark basement flat in Brixton (like me) they change the environment a lot more than you think. 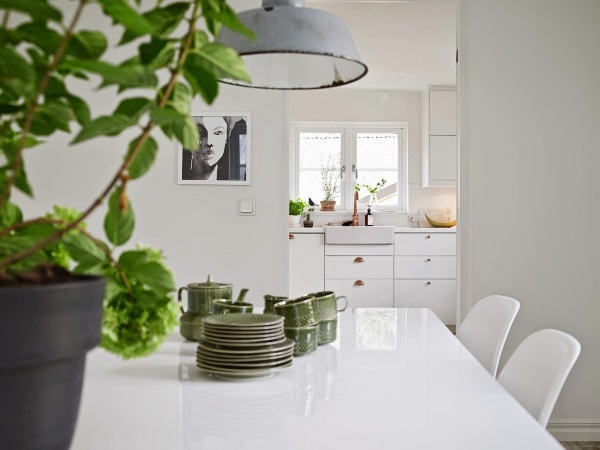 When I saw this lovely home on My Scandinavian Home it reminded me that I still need to pick up some more, so I thought I'd also share it here. I don't think I could live here without kicking that plant pot down the stairs, mind you. It's a bit of a hazard.